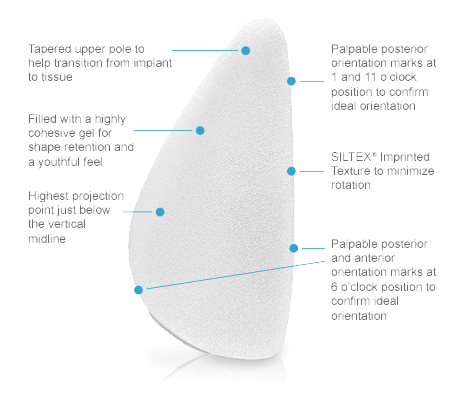 Why teardrop-shaped, contoured implants may not be right for your body. During your consultation, Dr. Jacobson will discuss many types of implant options, including shaped-Teardrop implants. These implants are preshaped to give more volume on the base of the breast and provide a tapered, contoured look and feel, however, there are other options that provide significant benefits over this type. There are several types of implants a doctor may use for your upcoming procedure and can vary from a round implant, to a more anatomical “teardrop” shaped implant. Most commonly referred to by doctors and manufacturers as Teardrop or Anatomic Implants. Manufacturers and doctors use these two terms interchangeably. 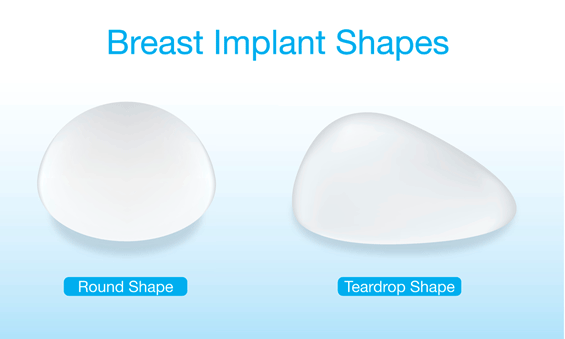 Contrary to the teardrops’ round counterpart, these implants are pre-shaped and tapered towards the top of the breast. Giving more volume to the base of the breast. Although the Teardrop Implants are created to allow a better, natural shape for the breast, they must be manufactured more firmly to retain its’ shape. As a result, the teardrop implants feel less natural to the touch. Previously used only for reconstructive purposes, some surgeons have used these more recently for cosmetic procedures to remarkable success. However, one of the most significant problems with this implant is how likely they are to rotate once placed. This may even be to the point where the shape no longer favorable. In the extreme case, the base of the breast may work its way to the position the tapered side had previously held. Sterile techniques have been developed to keep the breast fixed to the chest wall, so it cannot rotate. But, unfortunately, these do rotate at times. Once this happens additional surgery would be required to place it back into the proper position. At that point it would be safe elect for a normal, round implant. Which is why, the most commonly used implants are round, not anatomically shaped. The round implants form a circle on a surface, but once placed vertically in the body most of the gel in the saline gravitates the base of the breasts, giving a more anatomic shape. As a result, the anatomic implants are not necessary to get a similar look. In Dr. Jacobsen’s mind the disadvantages from the possibility of the implants rotating, weighed with the firmness of the implant make this implant not favorable in most cases for women. As a result, Dr. Jacobsen does not use anatomic or shaped implants. Although Dr. Jacobsen does not utilize anatomic implants in his practice, they are available to show at the time of consultation along with the other implants we carry.